This Hotel Parking Garage, constructed in the 1970’s, was badly deteriorated due to years of water intrusion. Snow melt off of vehicles and routine cleaning contributed to the intrusion. Located in Downtown Denver Colorado, this 140,000 sf, 5 level double tee constructed garage repair project consisted of 4 major work phases. The first repair phase was the precast concrete members of the structure. 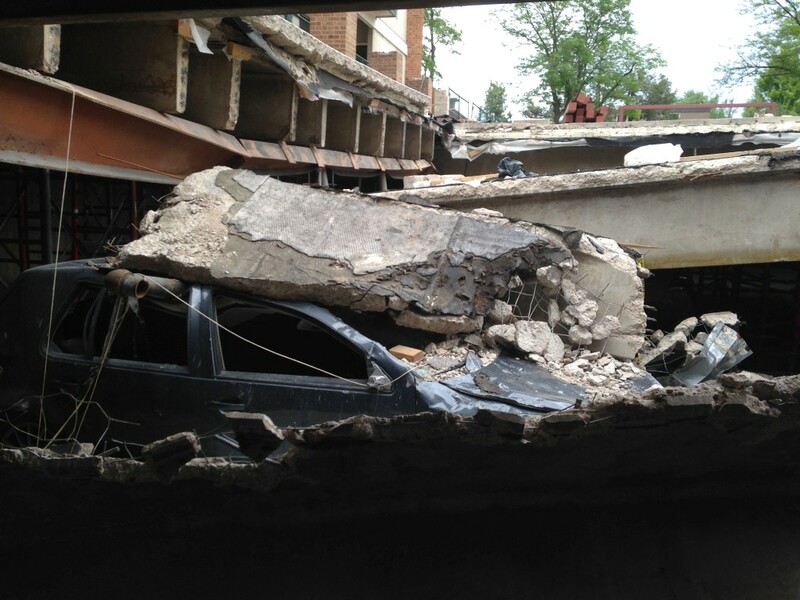 The repairs needed due to corrosion of reinforcing in the garage’s double tee beams, inverted tee beams, and structural columns required a widespread shoring scheme, prior to excavation. In order for the shoring to distribute the loads properly level by level, it was required that the shoring in the garage be shored down to grade. 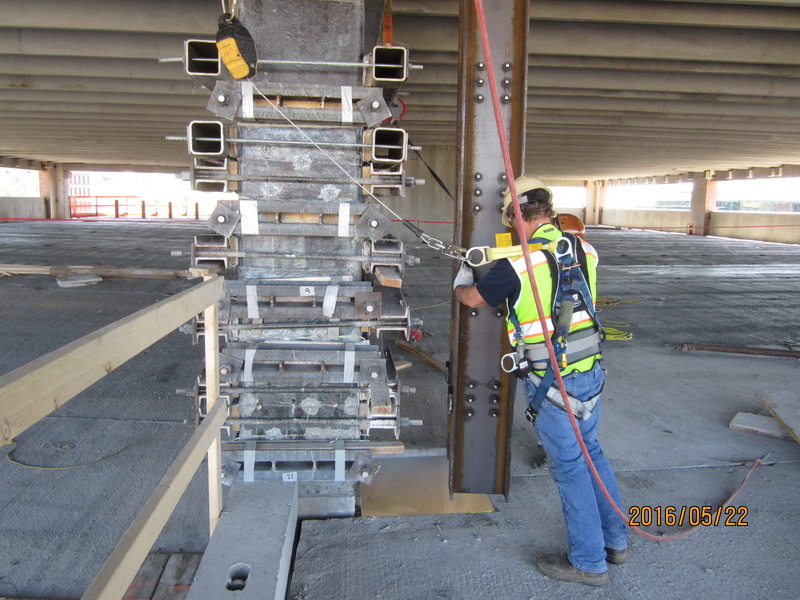 In an effort to expedite the structural precast concrete repairs, Restruction Corporation utilized 72 shoring towers throughout the project. It was imperative at the beginning of the project that the garage remained operational for the Hotels guests. The project team was able to sequence the repairs with minimum impact to the hotels day to day operations. These major structural repairs were completed using the following repair methods: concrete excavation and replacement, shear crack epoxy injection, installation of a double tee stem shear section enlargements, structural rebar replacement, and bearing pad removal and replacement. The second repair phase of the project was the removal and replacement of the 3”-5” structural topping that had debonded from the existing double tees below. An initial engineering report stated that the lobby level was debonded and needed full removal and replacement. Bond testing was completed at other levels to verify the condition. After reviewing the low bond test results of the main street level of the structure required full removal and replacement of the bonded topping, while the other three levels above grade would only require localized topping repairs. Hydro demolition was the chosen method of removal over the use of jackhammering equipment. By using the 36,000 psi water jets, the team was able to shorten the scheduled repair time, and minimize the noise that impacted hotel operations. There were also areas in the topping repair zone where the double tee flange below was deteriorated that required a full removal and replacement. This full depth repair required extensive fall protection measures to ensure onsite safety. Where large areas of full depth repairs were encountered, the use of support blocking between double tee stems was installed to mitigate the pre-stressed structure from shifting. 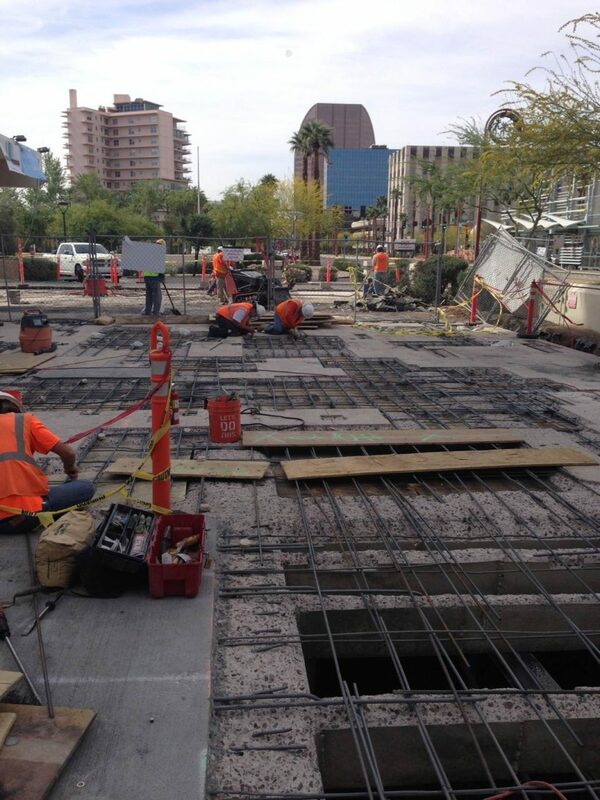 The topping and full depth repair areas were then replaced with a fiber reinforced structural concrete. 500 cubic yards of concrete was placed over the duration of the project. Once design strength was achieved, Restruction Corporation was able to open portions of the garage for parking. The third repair phase consisted of the installation of new plumbing lines, drains, and a urethane traffic coating. This portion of the work protected the newly repaired structure by mitigating new water intrusion. Existing cracks and joints were routed and sealed in preparation to receive the coating. The use of an epoxy mortar extended with sand was utilized in areas of the garage where there was concrete scaling. The heavy duty urethane traffic coating was applied in 3 layers: base coat, intermediate coat, and topcoat. 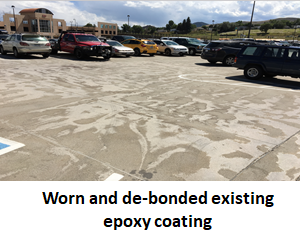 The traffic coating works two-fold; it protects the concrete from water intrusion, and creates a wearing course for vehicular traffic that will not damage the waterproofing properties of the coating. The new plumbing was laid out to catch the existing water ponding areas that would have eventually caused more future damage to the structure. The final phase of the project was the repainting of the garage. 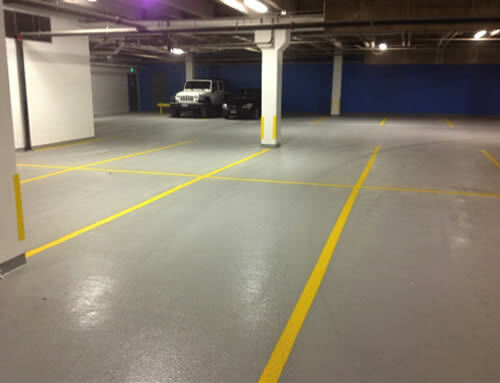 After years of use, with no full scale repainting project since the parking garage was built, the owner felt that in order to have a complete project they needed to increase the visual appeal of the garage. All of the existing walls, columns and beams were repainted, with different colored accent walls of the owners choosing. 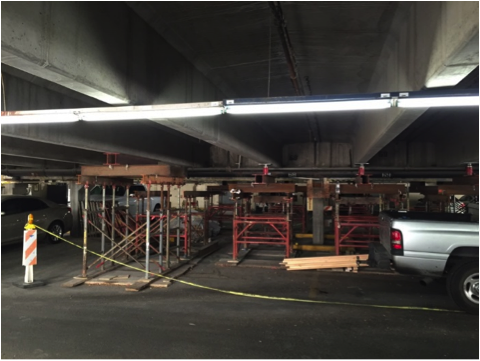 This parking garage repair project required extensive collaboration between Restruction Corporation, the owner, and the engineer. The project team held weekly meetings, worked around shutdown times for events, and collaborated with city officials minimizing impact to the public. The successful repair project was completed with the ability to work as a team striving towards a common goal.